The historical city of Knidos is located at the tip of the peninsula, and was the site of one of the earliest astronomical observatories and medical schools in history. Today, you can still see the remains of an ancient theater, two doors of the Acropolis, and the temples of Dionysos and Appollon. Along with Halicarnassus and Kos, and the Rhodian cities of Lindos, Kamiros and Ialyssos it formed the Dorian Hexapolis, which held its confederate assemblies on the Triopian headland, and there celebrated games in honour of Apollo, Poseidon and the nymphs. 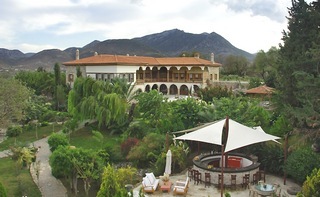 Mehmet Ali Aga Mansion served as the home of the Tuhfezade Family, who were influential in the socio-economical and political life of Datça for over two hundred years. Restored in the traditional manner, keeping the Anatolian landed gentry family atmosphere intact, Mehmet Ali Aga Mansion is now a “museum hotel” offering comfort and peace in an authentic environment to its guests. 2006 they have added a swimming pool which has now made this the ultimate hotel not only with it's authentic location and style now for the summer days between the seas of datcha and the pool all comforts can he found. Overlooking the majestic Mediterranean coast and surrounded by mountains, This newly renovated hotel offers tastefully decorated sea view rooms, where you can sit and enjoy cool sea breezes and breathtaking views of the Greek Islands Simi and Rhodes.